Time to write about one of my favorite items in my running drawer (or should I say, drawers), compression socks. I love these darn things. They keep my calves going when they should be screaming for me to stop. I only wear them for runs above 8 miles and slip into a new pair after that run for recovery. Pro Compression was kind enough to provide me with a pair to try out and I love them. I have the sleeves and the ankle socks from them and now the marathon socks. I've tried a few other brands but Pro Compression socks have definitely held up better than some others. I love them and will continue to purchase from them. This month the the Sock of the Month compression sock is an awesome black with neon dots. I LOVE this sock!!! The only down fall to EVER pair of compression socks is the amount of effort it takes to take them off after a long run. The last thing I want to do is battle with my socks but I know they've done their job when I have to lay on my back and pull or have my husband pull them off for me. Here's the good part, they've given me pair for one of my lucky readers. Enter below. I love pro compression. I use them for both during and after running. They are a huge help for when my calves start to bother me. I have tried them and usually use them for recovery. i have never tried pro compression, but I do have 1 pair of CEP calf sleeves that saved my life at my first full. One of the best impulse purchases I have ever made! I would love to try these, and could use an extra set for recovery! I love my PC socks. I wore them for the first time on a run at Tink this weekend and I'll never do a long run without them again. Love my ProCompression socks! I wear them on runs & for recovery. I have never tried this brand. I do wear compression calf sleeves during my long runs. I've never tried pro compression, but I'd love to. I haven't yet tried ProCompression but I would love to!! I have heard nothing but good things about them! I haven't tried Pro Compression, but I want to. I don't have any full length compression socks, so I'd experiment if they help me better during a run or for recovery. I haven't tried them, but I keep hearing good things about 'em! I've used Pro Compression, I'm a fan! YES! I use them mainly for recovery. I LOVE PRO Compression!! I mainly use them for recovery, but have used them during runs as well. THEY ARE THE BOMB DOT COM!! I use them for long runs and then recovery! So amazing! Pro Compression is great! I use them for both running and recovery. I've never used Pro Compression, but I have heard wonderful things about them and I know I need to get a pair of socks!! I LOVE ProCompression and I use them for both my runs and recovery! 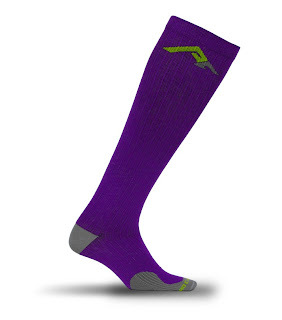 I absolutely love Pro Compression and wouldn't get through my half marathons without them. I just started using ProCompression and I love them!!! Pro compression are easily my favorite compression sock! I even run in mine sometimes! I love PRO Compression. I use the marathon socks on my long runs. Also have some trainer lows for shorter runs. I have a pair of the marathon socks that I wear for long runs and for recovery. They are also super comfortable and keep my legs warm for early morning runs before the sun is out. I wear Pro Compression both running and for recovery! I even wear them to work...i'm a nurse and do 12 hour shifts and they are awesome! I love compression socks for long runs. I only have two pairs one for running and one for recovery. I would love to try procompression! I love compression socks. I can't run in the though, knee socks aren't my thing for running, only recovery. I've run with compression socks and have worn them during sleep. At my age I can use every advantage for recovery! I love my compression socks though I've never tried ProCompression. I'd love to! Yes, I love my compression socks. I mostly use them for recovery but plan on wearing them during my half marathon in March. i've not tried anything from pro compression, but do have two other pairs of compression socks - would love to try them and review them! I love my pro compression sleeves and would love to try their socks! I bought my first pair at the Tink Half expo! I love compression sleeves for recovery, but this was my first pair of socks! I definitely use them for both! I haven't tried Pro Compression socks yet - but would like to. I love pro compression. I have a couple of pair that I wear around the house after a run and definitely during a run for my calves.